A still from the filmmaker's ad that drives home a message that Australia has blood on its hands whilst allowing trade in ivory and rhino horn (Image Credit: For the Love of Wildlife). 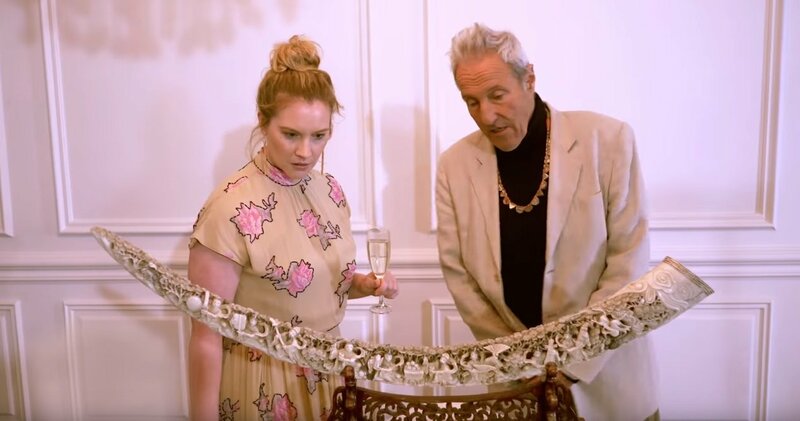 The pair joined forces with conservation group For the Love of Wildlife to create a social media commercial driving home a message that Australia has blood on its hands whilst allowing trade in ivory and rhino horn. It comes ahead of the outcome of a major international wildlife conference in London in October. “Like most Australians I had no idea that it’s still legal to sell ivory and rhino horn. When I found out I felt overwhelmed by a desire to do something about it. It’s despicable. It needs to stop. It’s the only ethical choice,” she said. “It’s unfathomable that we’re allowing this trade to continue when one elephant is killed every 15 minutes for its ivory, and a rhino every eight hours for its horn. Unless our government takes action to end it, we’ve all got blood on our hands,” he said. Miller’s mother, actress Sandy Gore, provided the voiceover for the commercial after hearing about the parliamentary inquiry into the trade. “In the 1970s I was gifted two ivory bracelets. At the time I was in my early 20s and had no concept of the degree of devastation these items had caused for elephants. I can’t change what happened to those elephants but I can do something now, however small, to give back and say enough is enough,” she said. In March this year the Parliamentary Joint Committee on Law Enforcement launched the inquiry into Australia’s ivory and rhino horn trade. Evidence has been heard from the Department of Environment, non-government organisations, antiques and auction industry, Customs and online selling platforms including Facebook. While the importing and exporting of ivory and rhino horn is regulated, it remains legal to buy and sell domestically. Founding Director, Donalea Patman, said damning evidence of the extent of wildlife trafficking in Australia had been presented through the inquiry and that there is overwhelming support to ban the ivory and rhino horn trade. In response to those who believe Australia’s trade may be small compared to countries like China or Vietnam, Patman says the true volume of Australia’s trade is unknown. “We’ve witnessed thousands of items for sale across just a handful of stores and online platforms, and in all of these cases, there wasn’t any documentation to prove an item’s age or legality. At best, sellers guess the age of items based on visual appearance. “It makes us complicit in the poaching crisis and it’s a responsibility the Australian Government cannot ignore. We’re deeply touched and incredibly grateful to Augusta, Michael and their team for creating such a powerful ad with a message that we know will hit home for all Australians,” she said. A recent Federal Parliamentary Inquiry has recommended that a full domestic trade ban is necessary and For the Love of Wildlife is asking Environment Minister Melissa Price MP to make this a matter of urgency, leading into the London Conference on Illegal Wildlife Trade in October.